Thanhouser Career Synopsis: N.S. Woods, also known as N.S. 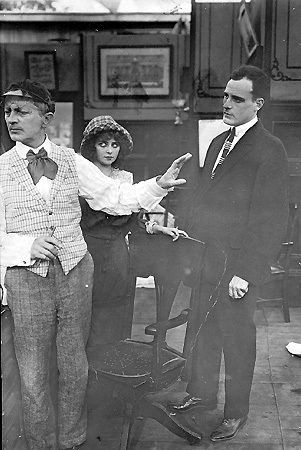 Wood, a character actor, appeared in many Thanhouser films of the 1912-1917 era. Biographical Notes: Nicholas Schaberger Woods, who was designated as N.S. Woods (or Wood) in film credits, was born in Germany in 1857 (according to records obtained from the Davis Funeral Home, New Rochelle, who handled his services). He went on the stage at about the age of six and achieved renown as "N.S. Wood, the Boy Actor." From about age eight to 13, he played the role of a page in numerous plays. Most stage notices gave his surname as Wood, indicating that he must have preferred this usage. In later years Woods took preference. When he was 13 years old, he had the title role in The Boy Detective. The following year an acclaimed role earned him the name, "The Boy Hamlet." For nearly the next 20 years he toured the country in melodramas. In 1879 and 1880 he had the lead in Out in the Streets, at the Third Avenue Theatre, New York City. In 1891 he starred in The Orphans of New York. An Autobiographical Sketch: An unattributed clipping preserved in the Robinson Locke Collection relates Woods' own description of his career: "When did I go on stage? Well, I guess it was in 1870, when I was about six years old. It may have been earlier, but that's as far back as I can remember. There never was a member of our family on the stage, but I might have been somewhat of a precocious youngster, for about that time I was reciting poems and things in the old Trinity Chapel at 24th Street and Broadway, and at the Tabernacle, at 35th and Broadway. Just how affairs developed, I have never been able to figure out, but between that time and my 11th birthday I played a page and other children's parts for Madame Janauschek, Edwin Booth, John McCullough, Adelaide Nielson, and, in fact, for nearly all of the older stars. "In the meantime I had learned Hamlet's soliloquy and recited it at the old Tabernacle. Some persons connected with the stage heard it and evidently thought it would be a great idea to have a boy of 11 play Hamlet. Well, boylike, I jumped at it, and in three days had learned the rest of the part - about 1,100 lines. Well, I played Hamlet - that is, I pronounced the lines, but I knew not what they meant, and no child of that age ever could. My life as a 'star' boy actor then began, wherein I appeared in the old Bowery Theatre in The Boy Detective. My next effort was in Poor Joe, a version of Bleak House, in which I opened in Philadelphia in 1876. Then came Jack Harkaway and again Hamlet, in which character I played in Booth's old theatre at 23rd Street and 6th Avenue. Among those who played with me in The Boy Detective, who became famous, were Thomas Keane, Louis Aldrich, and Eugenie Blair. "In 1879 and 1880 I was the leading character in Out in the Streets.... I then went on the Jacobs and Proctor circuit for five years, and for the next four years was on the road at the head of The Orphans of New York. I was still on the road during the World's Fair at Chicago , and during that exposition five pounds of candy cost me just $20,000. The candy business looked good then, and I was induced to go into partnership in a factory for its manufacture. I couldn't attend to the business, being out with my company, and I saw the establishment just twice. During those two visits I secured five pounds of the candy I was making, but that was all I ever did get. It kept me busy sending cash for running expenses, until finally the plant was burned. That settled it for me. One of my most pleasant experiences on the stage was in 1879, when for a time I was with the stock company presenting A Scrap of Paper at the old Wallack Theatre at 13th Street and Broadway." Woods' Later Career: In 1899 N.S. Woods was with James R. Waite's dramatic company. In October 1903 he was seen in New York City. At the time he maintained his residence at 529 Halsted Street, Brooklyn. His wife having died several years earlier, he lived alone. Madame Janauschek, who in her old age was paralyzed, lived nearby, and she commissioned N.S. Woods to tend to her financial affairs. In February 1906 he was seen in The Boy Scout, at the Standard Theatre in Philadelphia. A notice in the March 8, 1910 issue of The Cincinnati Commercial told of his work as Shorty in The Squaw Man and related that Woods "left the stage some years ago, but he was induced by Liebler & Co. to resume this season." At one time in his life Woods may have been a locomotive engineer. Later, he became a character actor in films. In addition to his stint with Thanhouser from 1913 to 1917, he appeared in Helen Holmes films in 1916. From at least 1910 through 1918 he lived at No. 5 on The Boulevard in New Rochelle. N.S. Woods died at the age of 78, on March 21, 1936 (an account in The Billboard gives March 23rd as his death date) in New Rochelle, New York and was buried on March 24th. He was survived by a sister, Mrs. John Becker. As noted, funeral parlor records indicate he was born in 1857; his autobiographical sketch, given above, suggests a nativity date of circa 1864. His surname at birth was Schaberger, but this was sometimes shortened to Schaber in various mentions. Note: Photoplay Magazine, issue of December 1916, stated that an N.Z. Wood (sic), of the Signal Film Company, died in September 1916, that he had been a locomotive engineer before going into films and, for the preceding year, had been in all of Helen Holmes' films.